Anyway, for whatever the reason, I settled on 2 Gingers and it turned out to be a decent buy. 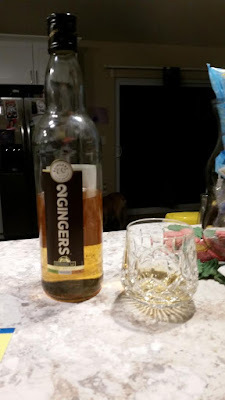 I haven't really explored too much of Irish whiskey beyond the usual suspects of Jameson and Bushmills, so it was nice to break out and spread my wings a little bit and try something new. So what's the deal with 2 Gingers? It's from Minnesota... yeah... that was kind of a puzzlement to me as well. But Minnesota bar owner and businessman Kieran Folliard was inspired by his fiery haired mother and aunt (Mary and Delia) to found 2 Gingers. So it claims Minnesota as it's home, but was founded by an Irish man and made in Ireland... that's kind of cool, actually. I like that. A Midwest Irish Whiskey. I didn't know such a thing was possible, but I'm happy that I found this out. It gets even more interesting when you dig into the history behind the Kilbeggan Distillery. Body: Nice and spicy- which is appropriate, given the name of the whiskey. There's honey and cinnamon with undertones of ginger- which again, also appropriate. Palate: Sits easily on the tongue- it's not weak and watery but it's also not heavy and syrupy either. It's nice and balanced, The taste is spicy as well, but it's not harsh, it's not burning- it's just the right amount of goodness. Finish: Warming but not harsh and goes down easy.